As of late 1988, the last official census in Angola had been taken in 1970. As a result, most population figures were widely varying estimates based on scanty birth and death rate data. According to the United States Department of Commerce's Bureau of the Census, Angola's 1988 population was about 8.2 million. The United States Department of State gave a 1986 figure of 8.5 million, while the United Nations (UN) Economic Commission for Africa estimated the mid-1986 population at 8.9 million. The Angolan government estimated the 1988 population at almost 9.5 million. The government figure, however, may have included Angolan refugees in neighboring countries. According to the U.S. Committee for Refugees, a private agency, in mid-1987 more than 400,000 Angolan refugees resided in Zaire and Zambia. There were about 50,000 Cuban soldiers and civilians and about 2,000 military and civilian advisers and technicians from the Soviet Union and the German Democratic Republic (East Germany) stationed in Angola. There were also about 10,000 South African refugees, most associated with the antigovernment African National Congress (ANC); 70,000 Namibian refugees, most associated with the South West Africa People's Organization (SWAPO); and 13,200 Zairian refugees. There was no officially reported immigration or emigration. In spite of warfare, poor health care, and the large number of Angolans in exile, the population was growing steadily in the late 1980s. Like population estimates, however, growth rate calculations varied considerably. According to a 1987 estimate by the United States Central Intelligence Agency (CIA), the growth rate was 3.6 percent. The UN 1986 estimate of 2.7 percent was a good deal lower, while the government, whose demographic estimates typically exceeded those of Western governments and international organizations, announced a 1986 growth rate of almost 4.9 percent. The CIA figured the infant mortality rate in 1987 at 167 per 1,000, and the United States Bureau of the Census calculated the death rate at 21 per 1,000. 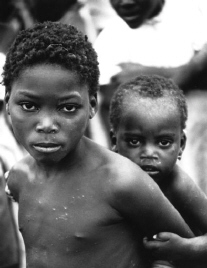 According to UN figures, Angola had a very young population. In 1986 the UN estimated that about 46 percent of the population was under age fifteen. At the other end of the age scale, only 4.8 percent of the population was sixty years of age or older. The government estimated the median age at 17.5 years. Life expectancy in 1987, according to United States government sources, was forty-one for males and forty-four for females. The 1970 census showed the most densely settled areas of Angola to be the plateau, those coastal zones including and adjacent to the cities of Luanda, Lobito, Benguela, and Moçâmedes (present-day Namibe), and the enclave of Cabinda. The most densely settled province in 1970 was Huambo. The other large area of relatively dense settlement included much of Cuanza Norte Province and the southern part of Uíge Province. This area was the major center for coffee cultivation and attracted a number of Europeans and migrant workers. Except for Zaire Province in the far northwest, the most thinly populated areas of Angola lay in its eastern half. Since the start of the independence struggle in the early 1960s, an almost continuous process of urbanization has taken place. This process was accelerated in the 1980s by the UNITA insurgency, which induced hundreds of thousands of Angolans to leave the countryside for large towns. Angola's urban population grew from 10.3 percent in 1960 to 33.8 percent in 1988 (according to government statistics). Much of the growth occurred in Luanda, whose population more than doubled between 1960 and 1970, and which by 1988 had reached about 1.2 million. Other towns had also acquired larger populations: Huambo grew from less than 100,000 residents in 1975 to almost 1 million in 1987, and Benguela's population increased from 55,000 to about 350,000 over the same period. After independence in 1975, there were a number of changes in the structure of the population. The first was the exodus of an estimated 350,000 white Portuguese to their homeland. Yet, by 1988 there were an estimated 82,000 whites (representing 1 percent of the population), mostly of Portuguese origin, living in Angola. The second change was brought about by large-scale population movements, mostly among the Ovimbundu who had migrated in the 1950s and 1960s to work on coffee plantations in northwestern Uíge Province. Panic-stricken by the onset of civil war in 1975, most Ovimbundu workers fled to their ethnic homelands in the central provinces. Another large-scale population movement occurred as many of the Bakongo who had fled to Zaire during the nationalist struggle returned to Angola. The third and most striking population shift, most notable in the late 1970s and 1980s, had been the flight of increasing numbers of internal migrants out of the central provinces, where the effects of the UNITA insurgency had been most destructive. Most of this massive migration had been toward urban areas. From 1975 to 1988, millions of rural civilians were displaced, including more than 700,000 forced from their villages since 1985 by armed conflict. Many of these migrants relocated to ramshackle displacement camps, many of which were run by West European private voluntary organizations. Although these camps were less vulnerable to attacks by UNITA guerrillas, conditions in them were poor. Food and water were in short supply, and health care was limited. Many of the displaced persons living in Benguela Province were Ovimbundu from the plateau regions of eastern Benguela and Huambo provinces. The officially registered displaced population of 21,478 in Benguela Province (1988 figure) lived in nine camps and one transit center, but there were probably thousands more living with family members in the province's urban areas, including Lobito and Benguela. The estimated 116,598 displaced persons living in several camps in Cuanza Sul Province had been forced to flee from the province's eastern rural areas or from the plateau regions of Benguela, Huambo, and Bié provinces because of intense guerrilla activity. Because access to many rural areas was limited and sometimes impossible, most of these displaced persons were forced to rely on other local populations and some limited and sporadic outside assistance. Most displaced persons fled from the more fertile and wetter highlands to the less hospitable coastal zone and would be expected to return to their homes when the security situation improved. In 1988, however, the majority of displaced persons had become integrated into the larger urban population, especially around Luanda. Many displaced persons who sought refuge in urban areas did so through family or other relations to circumvent government registration procedures and so avoid taxation, conscription, or forced resettlement. Consequently, the exact numbers of these people could not be computed. In Luanda much of the destitute population, estimated at 447,000 and mostly consisting of displaced persons, lived in vertical shantytowns (large apartment blocks in the center of the city with inadequate or nonexistent water sources or sanitary facilities) or in huge, maze-like neighborhoods known as musseques, the largest of which housed an estimated 400,000 people. For more recent population estimates, see Facts about Angola.